There’s something intensely personal about pushing yourself in sport. 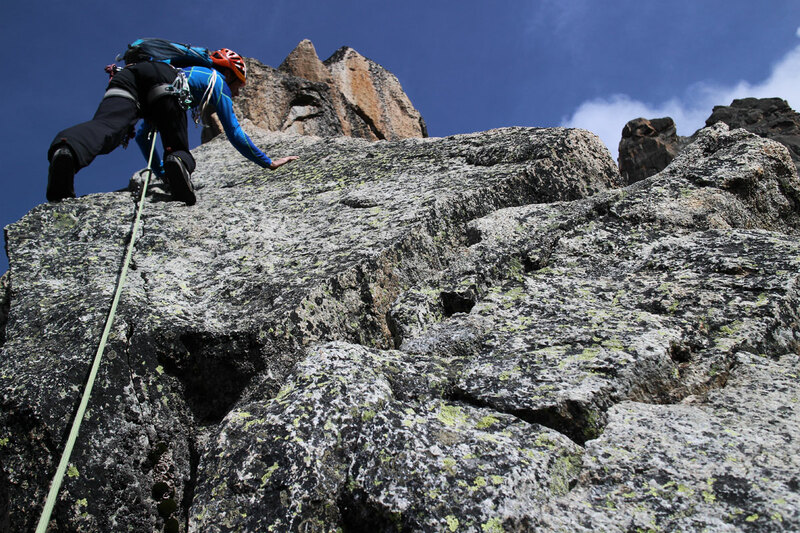 At an elite ‘amateur’ level in rock climbing there’s no big pressure to try hard, there’s no technical support, no physiotherapy team, no nothing, you’re out there on your own, making your own decisions and mistakes. 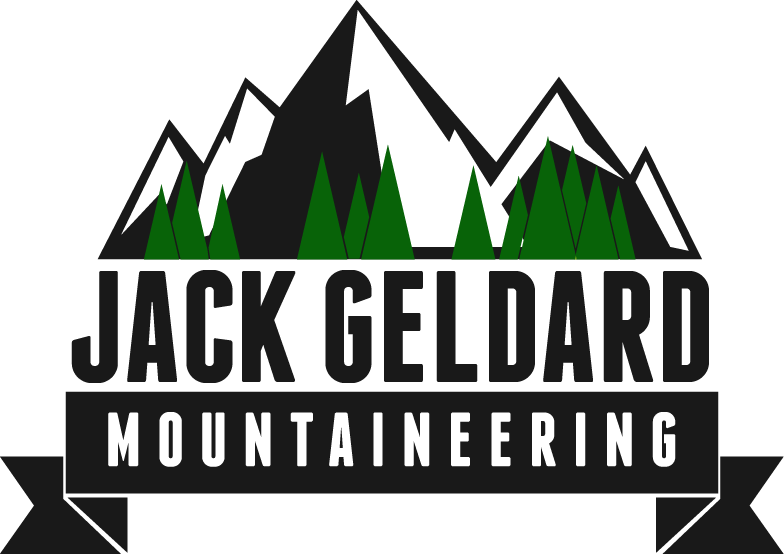 National climbing teams may have some more support of course, and the very best or most famous and successful climbers in the world (you can count them on your fingers!) can afford to pay for sports physios, and just by the fact that they are that good and famous, a lot of doors to knowledge are opened for them, be that from other experienced peers and other climbers, or team coaches etc. However, for the majority of us, the most we can expect is our mate to buy us a beer if we climb our hardest route, and to be honest even that is a rarity (are you reading this Steve… where’s my pint?!). Steve climbing a fantastic 7c+ at Balme de Yenne, less than 2 hours from Chamonix. 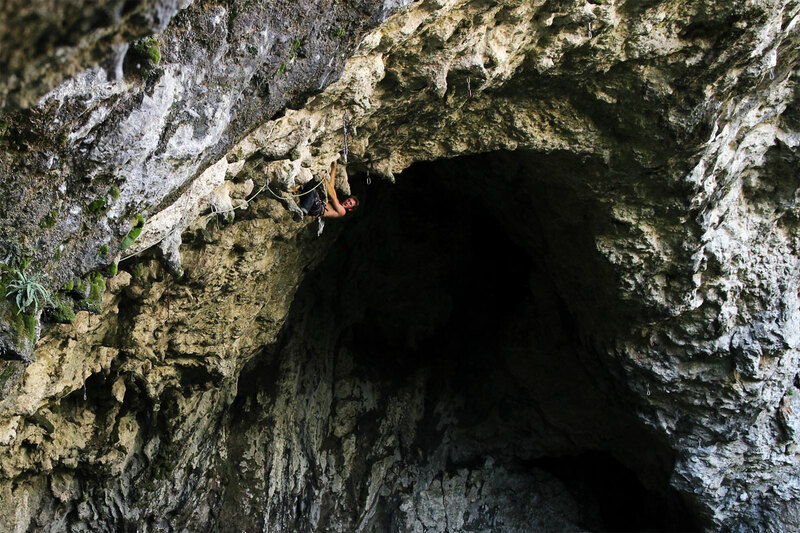 A steep and fantastic tufa crag with stiff grades and endless hard routes. Steve is a brilliant climber who tries his hardest, but never seems to stress about his performance. Maybe this is because he’s so old?! Yet, despite all of this I have countless friends who are fantastic climbers, pushing themselves really hard, and sometimes having a lot of fun doing so, but sometimes they are not having fun. A father and son team attempt a desperate 8c+ at Anthon, near Chamonix earlier this summer. The conditions were terribly hot, not suited to this slippery, bouldery route. The father was relaxed, and happy to belay, but his young son (who was clearly a fantastic climber) was extremely stressed at not being able to climb the crux moves of this hard route. 6a+ climbers lounge in the springtime heat in the background. Stress, disappointment, fear, and anger are all common emotions to find out on the crag. (I’m talking sport climbing here). This past week sport climbing in Turkey I have seen people scared to fall in safe situations (very common, it happens to everyone) but then getting very stressed or disappointed with themselves for being like that. Also I’ve seen people afraid to commit to climbs due to being intimidated. I’ve seen people screaming swear words and actually punching themselves on the head for not being able to do the moves on their personal project. Surely the guy (who almost gave himself brain damage by punching his own head!) 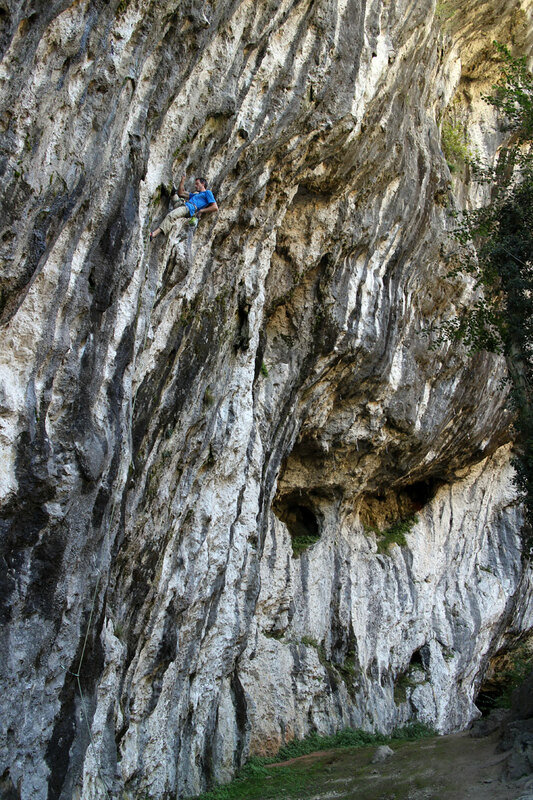 on the 7c+ realises that no one else in the world cares if he can climb this route? That it isn’t a big deal? But for him it is a big deal. His frustration and anger are all his own creation, but for him they are 100% real, and despite doing no good for his climbing, he easily slips in to that stressed state. If nothing else, maybe he should get a helmet! Seriously though, much more rare is the ‘happy faller’. Up they go, trying as hard as they can (Jonny Baker) and then with a hoot and a laugh, they peel from the rock when the moves get too hard, laughing all the way until the rope comes tight. I must confess that I am in-between the two, I don’t punch my own head, and most of the time I am having a lot of fun climbing, but I do occasionally get a little stressed, but it gets less and less the older I get. Myself finding my own limit of what I feel happy climbing in trainers without chalk – Chamonix trad 6a slabs are pretty tough! Always fun to be in the mountains with Emily though. Photo by Emily Andrew. Recently I have been reading a few books based around this 10,000 hours rule of elite ability – the concept that anyone can be an elite performer at anything if they put in 10,000 hours of focussed practice. (I was started on this subject by fellow climber James McHaffie, who recommended the book Bounce). One of these books – which I think is the best I have read so far (James, you should read it) – is The Sports Gene by David Epstein. David talks (as do many other authors on this subject) about Conscious Bandwidth. The phenomenon whereby an experienced athlete has basically more spare brain power to notice things going on. In the middle of a hectic football game, a seasoned professional sees everything that is happening on the field. It’s the same in rock climbing. Climbers with more experience read moves faster and more accurately, they get less phased by blank looking sections of rock, and basically they are just way more relaxed and in tune with what is going on around them. That’s all well and good for actually performing well on the rock, and if you get your 10,000 hours in whilst you are still young, you can be an elite climber before you leave school… but… being less stressed with your climbing seems to come with age, not necessarily climbing experience, so I wonder if the same mental bandwidth broadening is happening with age but in a much wider sense? A wider sense of self? Me again! 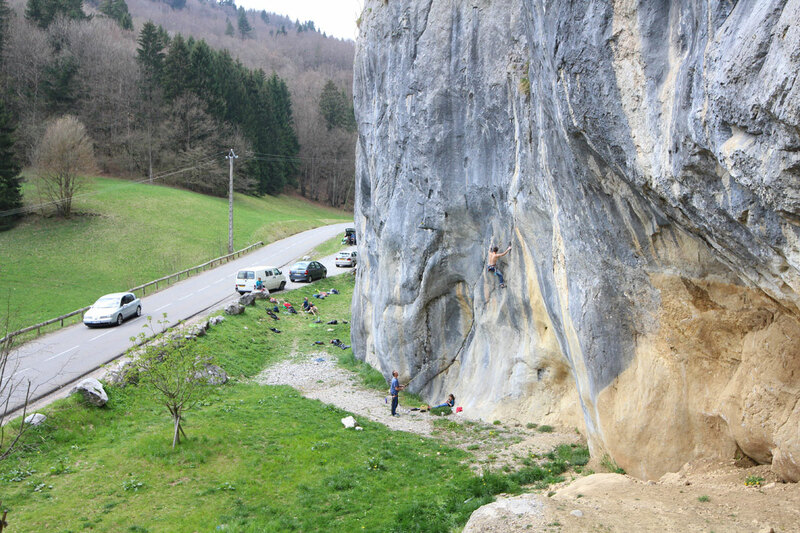 This time climbing steep sport at Balme de Yenne – enjoying the moves, not breaking any personal best barriers, and all without punching myself in the head. Photo by Heather Florence. At the age of 73 will my general life experience give me a much wider sense of what is going on around me? Will I see ‘pointless’ sport climbing projects as just that or will I see a deeper meaning in the things I have achieved as a younger man? A meaning that right now I don’t have the capacity to notice? Or will I simply remember back about how I could move fluidly over the rock, and enjoy that feeling of movement, with nothing deeper attached. I don’t know, but I do know that I enjoy seeing and talking to climbers of different ages and experience, and I really enjoy speaking to those climbers who have been at it much longer than I. We’ve all got a lot to learn, and perhaps one day I can say something to a younger climber that will stop him punching himself in the head! Who knows. And I hope that when I am older I can look back on my climbing experiences fondly, and enjoy the memory of movement and fun, and not the memory of punching myself in the head! Nice, I have been climbing for 40+ years and done all that… performance anxiety, fear of falling, being petulant when failing. Now I am 64, climb at my limit, which is probably the same as in my forties, as much as possible. I still feel a little sad when I blow the onsight or the redpoint but know that the next one will be better. For me, In this game it’s only the trying hard and having fun that matters. Hi Dave, glad to hear it! And thanks for the comment. It’s all about trying hard and enjoying it at the same time! Whoo, too true! I look back on the times I have been “stressed” while climbing, and my reactions to it, and I wish I could go back in time to confront my angry self. Now, I wouldn’t shake myself and tell me to stop it…no, I would grab myself by the shoulders (I wasn’t as strong back then, I could probably manhandle 20 year old me) and tell me to direct my anger and passion into improving at a deeper level, like working on weaknesses and the mental game. Thankfully, I’m 30 now and I have wisdom, and if I have as much MORE wisdom in ten years from now, I’ll be pretty psyched. And hopefully, not injured! Good luck Spencer! I hope you stay uninjured, and I hope I do too! Steve’s always climbed like that don’t think age has anything to do with it….. but i wonder if with age a climber becomes less selfish with his climbing- after all its only rock- not flesh and blood? Some people are just angry at a lot of stuff. I’ve done the swear words thing, usually on my own and usually when failing has been because of not trying hard enough. But I can get angry with the butter when it falls off the knife or when I’ve stacked the washing up too high and it comes crashing down or any number of trivial non-events that really no-one could care about. Good blog lots of great stuff here. Thanks for putting it out.